Happy weekend everyone, it's Saturday noon already here, and the first weekend of the summer holidays, But I won't count until the 15th of July, as my kiddos are attending summer school, SAT prep for my son, and daughter just don't want to sit at home, so she joining in for Grade 10 math, hopefully she will get a head start. I made this card, 2 days back, and was bit busy to share, finally had some time to share, before I head out. When I saw Therese's card at Time Out, I just wanted to CASE it, she is one of the crafters I admire a lot. She simply has magic in her hands!! I love her cards. 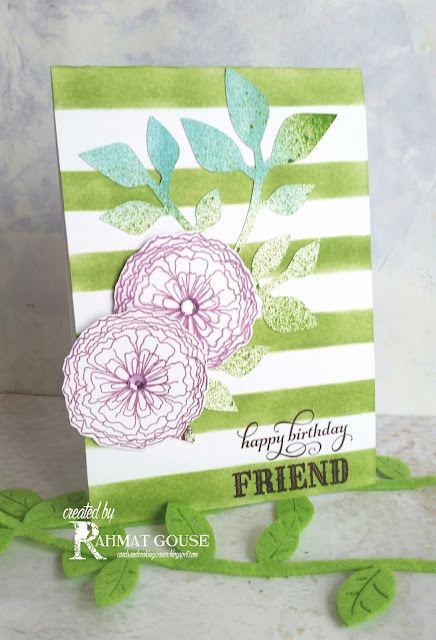 I started with a homemade stencil of broad horizontal stripes, and used wild wasabi from Su to ink up, and then I stamped and fussy cut the flowers from ME - freestyle florals. I sprayed a water color paper with some distress ink - mowed lawn, and ran through my bigshot using a leaf die. I added the leaves and flowers and the sentiment is from Wplus9 - embroidered bouquet. I hope you all like my case here. I am sort of satisfied with it. A card filled with elegance - from the flowers & leaves to the colors! So lovely! I love the look of this. From the thumbnail, I thought it was a corrugated background... excellent green shades! Have a great weekend. Thank you so much for your kind words, I have to say that I adore your beautiful card those flowers are so so pretty! What a gorgeous CASE of Therese's card. Love how you did the leaves.